Some artists are born creating, never stray from that path, and spend the majority of their lives doing just that. Others, although enamored with creativity and expression, go a more traditional direction and let art take a backseat to careers and everyday life. The three artists featured below fall into the latter camp, and describe a singular moment or experience of an overwhelming desire to create. And lucky for us, they did not ignore those thunderclap moments and went on to master their crafts. Visit their galleries or shops and take a piece of their creativity home. Nestled in the picturesque main street of historic Bisbee, you’ll find Grant Sergot most days, busy crafting custom hats for customers from all over the world. An uninformed passerby may glance through the window of Óptimo Custom Hatworks and mistake it for a quaint albeit run-of-the-mill hat store. But inside, Grant is carefully designing in his unique mediums: felt and straw. The path that landed Grant squarely in hat-guru territory started by mere chance when he drove into Arizona, along with two dogs as passengers. When his truck got stuck in the mud near the Grand Canyon’s south rim, he found himself sitting around a campfire with an old burned-out ranch hat he found to help keep the snowflakes off his face. “As it snowed, the brim got more wet and I realized I could manipulate the brim,” he recalls. “In the morning, I threw it up on the dash of my truck and could manipulate even more as it dried, and I realized this is a medium like clay or plaster.” When he couldn’t shape it any longer, he pulled out a tea kettle and got to steaming the Old West, cowboy way. Later, Grant discovered a shimmering hat on a wooden milk crate at an estate sale, beckoning to him, as he tells it. This fortuitous encounter with a real-deal Panama hat only further shaped his life’s work. “When I first began making hats in a gallery, everyone thought I was crazy. I said someday I’m going to be in Arizona Highways, and now I’ve been in several times,” Grant reflects with pride. Since then he’s made quite a name for himself, and grown a loyal following. He’s also collected antique tools from all over as traditional hat shops fell by the wayside. One such fascinating tool of the trade is a conformer from 1911, invented in Paris in 1848, that looks something between a birdcage and a torture device. This is the first step to ensure a custom fit for anyone, any hat. And while you can definitely walk into Óptimo and select an artfully designed pre-made hat, having him make one just for you is the real deal. While going to school for a degree in fine arts, Carly Quinn was in need of a job and ended up working part time for a local artist making tile. What began as a way to pay the bills soon had her undivided attention. She begins on a blank canvas of terra-cotta-colored base tiles from Italy, which she then draws on with a proprietary wax resist pen. Once dried, she colors in between the wax lines with liquid ceramic glazes. She allows the glazes to dry before placing the tiles into one of the four on-site kilns. Known for her boldly colored scenes of the Southwest, Diana Madaras continues her reign as one of this region’s celebrated painters—but art wasn’t always what filled her days. 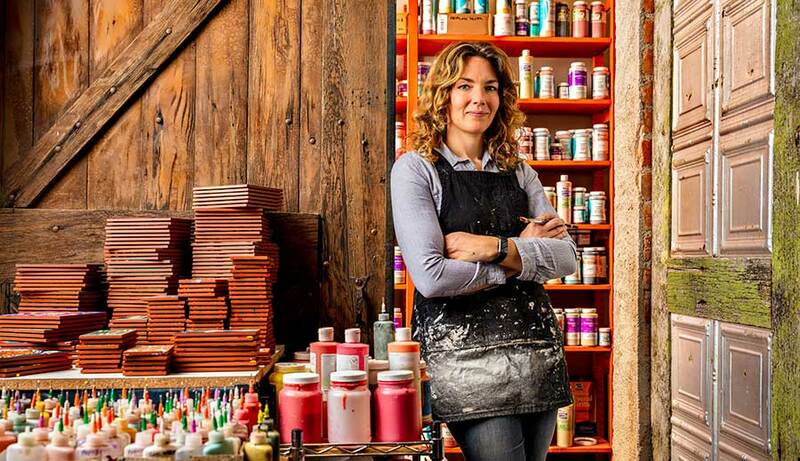 After running a successful sports marketing company for 12 years, she began dabbling in painting, which caught the eye of a professor at the University of Arizona. “He encouraged me to keep painting. He was relentless,” she recalls. In 1993, she took a month-long painting trip to Greece that changed her life. “It was as if I got off the plane and the world was black and white, and by the time I returned, it was in technicolor,” Diana explains. Upon returning, her corporate life no longer cut it, and after three years she became an official full-time artist. She opened Madaras Gallery and quickly garnered attention for her brilliantly colored depictions of the Sonoran Desert. Now with countless awards, exhibits, press, and a gallery shop on most Tucson visitors’ to-do lists—it’s clear this is where she’s meant to be. Longtime Tucson resident Sarah Burton decorates her home, her garden, and herself with desert-made products from local creatives.